I had the opportunity to speak with Ms Jacqueline McClelland on Wednesday, October 22 and she shared with me a conversation that she had with the Paris District Attorney’s Office. They were questioning as to why she spoke with the me about her son’s case and she believe it was just a scare tactic on the behalf of the authorities since the case has gained national and international attention in the last few weeks. We also got word the U.S. Justice Department is now investigating the case. I have been able to secure several radio appearances for her on a show in Boston, New York and others so far. More are to come. Plus I have spread the word about the case throughout the entire Grassroots Media Justice Tour. 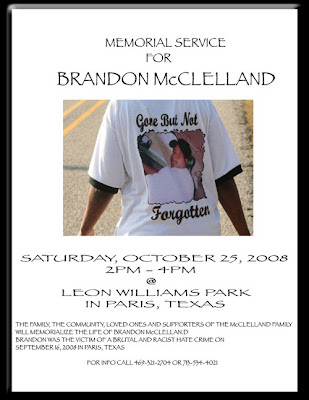 The family and organizations will be hosting a Memorial Service for her son, Brandon, on this coming Saturday, October 25. It will take place from 2pm – 4pm at Leon Williams Park. Black Suffering: Is Giving Up an Option? Gabrielle Douglas’ Revolutionary Act: Black People Don’t Owe America Our Allegiance!